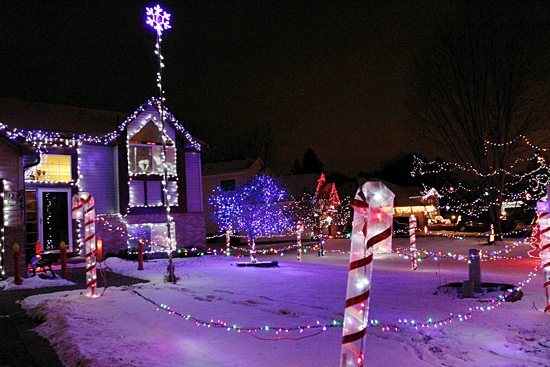 The Catholic Spirit asked readers to let us know about amazing Christmas light displays around the Archdiocese of St. Paul and Minneapolis. You responded, telling us about some spectacular ones. We have chosen three recommended by readers, and photographed by Dave Hrbacek, to show on these pages. We also picked one of our own to feature. Enjoy the work of these local “light” artists, and please go see them for yourself with family and friends to share in the Christmas spirit. Belle Plaine is a one-hour drive from downtown St. Paul, but the Bartolomeis make it worth the drive with their delightful display. They have been decking the outdoors since 2007, their first Christmas in Belle Plaine after moving from Michigan. The Bartolomeis, members of Our Lady of the Prairie in Belle Plaine, had help with the sign from a fellow parishioner, Christine Shudy, who designed it. Fabrication and installation were difficult, but that’s all part of the fun — and the many hours that go into their finished display. Schmidt used to race cars. 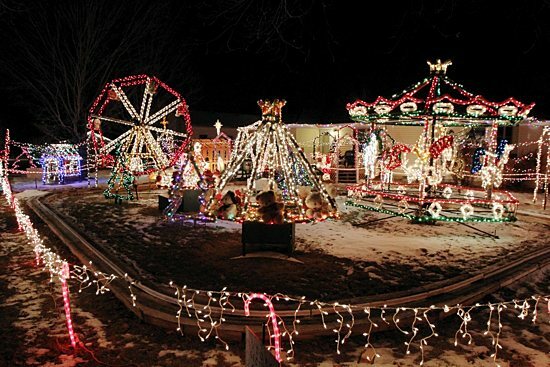 So, it’s only natural that motors are a part of his light display, which he started doing in 2000. He estimates there are 130,000-plus lights in the display. Fortunately, he has some quality help, from his parents, Lavina and Paul Schmidt of Sts. Joachim and Anne of Shakopee, and his sister Rena Lehman. Many of the lighted structures are motorized. In addition to the train, there are two merry-go-rounds, a Ferris wheel and swings. “It’s getting bigger all the time,” he said. He also has a live Santa and Mrs. Claus on hand the weekend before Christmas and the week of Christmas — long-friend Jeff Stark and his wife Lori. Plus, there are games for kids in the garage, along with arts and crafts. When you pull up in front of the Strandlof home, you’ll want to do two things: 1. Tune in to 97.9 FM, and 2. Bring some food items to drop off for the less fortunate. Strandlof secured an open frequency to broadcast music that people can play on their radios while they watch his lights, which blink in sync with the music. It might seem complicated, but Joe runs it all from a laptop. The difficult part is setting up the lights, which takes five days. The motorized Ferris wheel alone takes two days. But, it’s all a labor of love for Joe and Bri, who belong to Holy Trinity in South St. Paul. 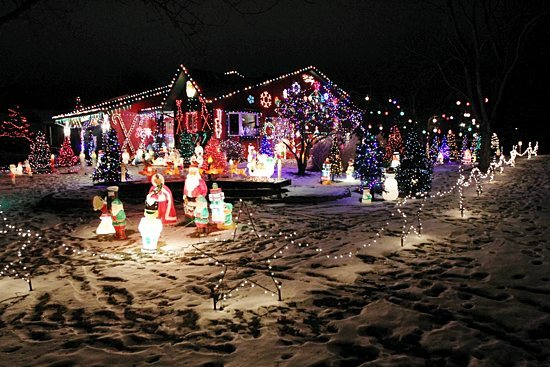 As much as he enjoys the light display, he’s also proud of the food he collects for an organization called Neighbors, Inc., which serves northern Dakota County. Last year, visitors to his house donated 750 pounds of food and $750. Joe’s parents, Joe and Sue Strandlof, also parishioners at Holy Trinity, help set up the display. And his brother, Ben, dresses up as Santa a day or two before Christmas and hands out candy to visitors. Employees of The Catholic Spirit know all about the Wolszons’ spectacular lights. That’s because John worked for the newspaper for almost 40 years before retiring in October. 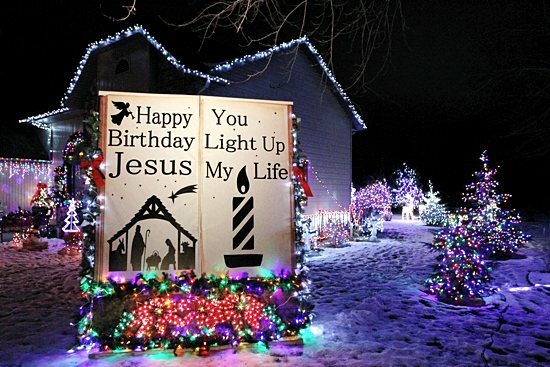 He and Jo have been displaying their award-winning lights for 26 years, the length of time he and Jo, who belong to St. Mary in Stillwater, have lived in their current home. Four years ago, John noted, their display won a contest sponsored by the St. Paul Pioneer Press. One look at his lights explains why — 35 lighted artificial trees, 117 Christmas figures, and lights covering all four sides of his home.